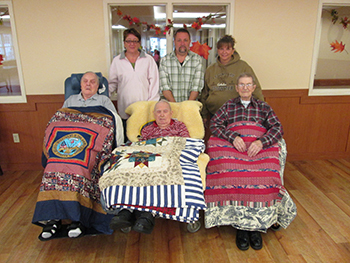 Handmade quilts were presented to the three oldest residents at Hometown Nursing Center. The quilts were a gift from the Summit Hill Heritage Center in horor of Veterans Day. Receiving the quilts were Joseph Wadyak formallay of Summit Hill, Lester Gerber formally of Tamaqua and John Zukas formally of Barnsville. Standing is Felicia Porambo Activity Director at the facility and Lyle and Andrea Mantz from the Heritage Center.